It’s a totally fun visualization tool – a sliding timeline down the left side of the screen lets you drill down to a year and browse through people’s memories from that year. Compared to where I grew up the UK seemed terribly crowded and also the university issued very careful guidelines about how to anticipate violence and certain areas to avoid and of course having grown-up in the middle of nowhere this seemed to be very shocking so I got myself a roll of ten pences and carried them in my hand to defend myself. You all know how much I love me some good information visualizations. Here’s a pointer to a year’s end top five for 2008 from FlowingData. Two of the five have been highlighted here over the past year – the New York Times, and Wordle. Last spring, I talked about showing a news visualizer from MSNBC called Spectra to a group of advanced composition students. And I talked about how none of the students chose to use that tool when they got to the hands-on portion of the class. I thought about that again this morning because three sections of that same course came in for library instruction. An aside – these classes aren’t the typical “how to find a scholarly article” sessions that I do. The students are being asked to engage with the public discourse in these papers. Instead of the “find three peer-reviewed journal articles” requirement, these students have to find three editorials or letters to the editor, as well as public conversation on websites like blogs or discussion boards. So what I show is very different than the things I show in most of my sessions – technorati authority ratings, advanced searches on Lexis-Nexis and the like. So we want to encourage some broad exploration of the conversations going on online and in the news media in this class. Especially this term, because in all 3 classes the students were turning in one paper and just beginning to think about the research paper assignment. Especially with this kind of find-the-public-conversation topic, it is so much easier when they browse the public conversations and find something that catches their interest and sparks their curiosity than it is when they decide on a specific topic and then have to knock themselves out to find discussion about that. And you can also drill down a bit by geographic location. Newsmap lets you choose to look at stories from Australia, Austria, Canada, France, Germany, India, Italy, New Zealand, Spain, the U.K., and the U.S. You can also display all countries at once and see them next to each other. So here’s the thing – lots and lots of the students chose to use this tool for browsing. Even though it can’t be searched. Part of that, I think, is because of where they were in their process. Most of them hadn’t even taken the time to think of a general topic area – they JUST finished the previous paper last night or this morning. So they were more amenable to the idea of browsing broadly. Part of it, though, is that they obviously found the interface intuitive. They weren’t just clicking on stories, they were using the tool to browse by country and by subject – everyone I saw was very active in how they used the site. I don’t know if they were getting the larger ideas about the patterns of the data that the treemap re-presentation of information is designed to provide. I don’t know if they were seeing how the format “ironically accentuates the bias” of the news, as the site creator claims. They asked me things like “how did you get to that colorful site,” and “where did you find that really visual thing.” And in each class, at least a third to half of them were using it for at least part of the time. So compared to last year, I call that a win for visual browsing. Somewhere, I thought that I had listed some of my favorite news visualizations from the New York Times. The NYT has really set itself apart among major newspapers with its creative and useful and glanceable visualizations. It’s the only newspaper I see regularly featured on my favorite infoviz blog – Information Aesthetics. So this morning I read (in Information Aesthetics, of course) that the NYT is partnering with Many Eyes to open the visualization lab up to the rest of us. There are only a few data sets there right now to play with but the topics range from baseball to religion to Sarah Palin. You have to work with them as-is, it’s true. So like many other projects the ultimate value of this will be determined largely by the quality of the datasets the NYT makes available. With Visualization Lab, NYTimes.com users will be able to visualize and comment on information and data sets presented by Times editors, share those visualizations with others and create topic hubs where people can discuss specific subjects. The visualizations that have been done will look familiar if you’ve looked at Many Eyes before – charts, maps, network graphs and more. There are also tag clouds, and Wordles, though I’m not sure what Wordle’s connection to the project actually is. 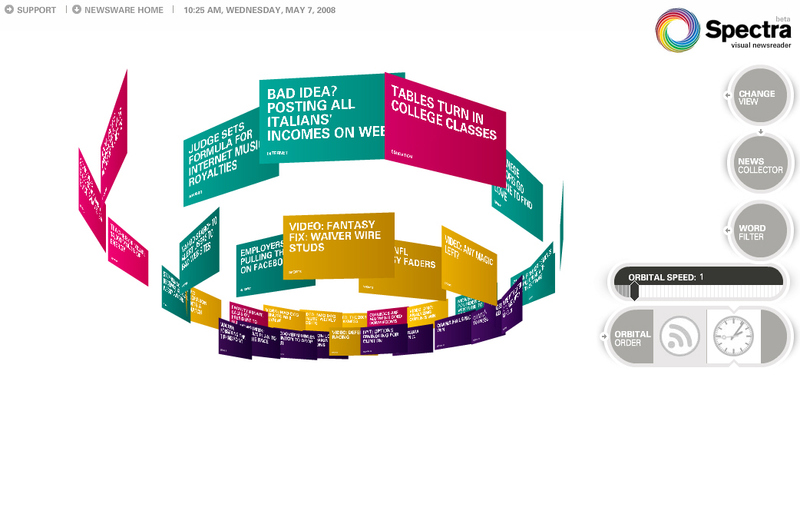 The awesomeness of the NYT visualization project isn’t an accident, it’s intentional. At last year’s InfoVis conference, Matthew Ericson’s keynote on bringing visualizations to the masses underscores this face (this account at the Visuale blog is thorough and interesting, though more focused on maps and mapping than the keynote was. It also includes a link to the slides). Bertini, linked above, says at the end of his account that the one thing that remained obscure after Ericson’s keynote was the tools the NYT was using to make these visualizations. Certainly, the tools from Many Eyes and Wordle have been available to all of us for a while – this doesn’t answer that question. But it does highlight how powerful some of the tools available to us on the emerging web are. edupunk — positive, negative, vitriol or faith, what does punk mean? I actually have no idea what the answer to that question is. I already mentioned the essay about the Clash which was about corporate rock, politics, and the reality of growing up in Canby, Oregon. But there’s also this short movie that the Willamette Valley Film Collective made last year to compete in the International Documentary Challenge. The Willamette Valley Film Collective membership varies, but the IDC competition has been a regular feature of hte WVFC’s schedule every year. Last year we looked at an exhibit of punk rock art at the library at Western Oregon University. Shaun has put a couple of versions of the final product up on his channel at Blip-TV. We edited this video between the hours of 11 pm and 5 am. And there’s a lot about the process I don’t remember that well. But what I do remember, and what I think is fairly tightly connected to the edupunk ideas that have been so well-discussed online over the last few days is in the description of the DIY aesthetic. As you can tell, that was a strong theme throughout the discussion of the meaning of punk, and of the meaning of punk rock art. And I think, *think* – it gets at some of the reason this term is resonating with people, at least a certain subgroup of people, around the web. well, not really bad metadata. More like the wrong metadata. Dipity lets you build interactive timelines. 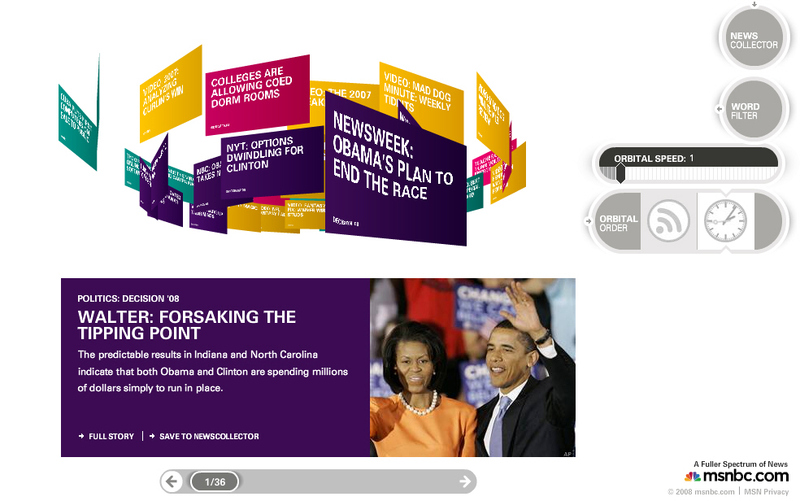 You can pull in all kinds of information sources — video, text, images — and display them in a nice, linear timeline. The interface is easy to navigate. Each item in the timeline can be viewed within the timeline, and each item has a handy “next event” button to make navigation easier. Anyway, I have some ideas for how to use this interface and if I ever get time to try them, I’ll post about it more. But that’s the thing – putting this stuff together does take time. If you choose the browse timelines option on the dipity site – there are a LOT of timelines with no events, with 2 events, with 4 events. I’d imagine a fair number of them will never be finished. 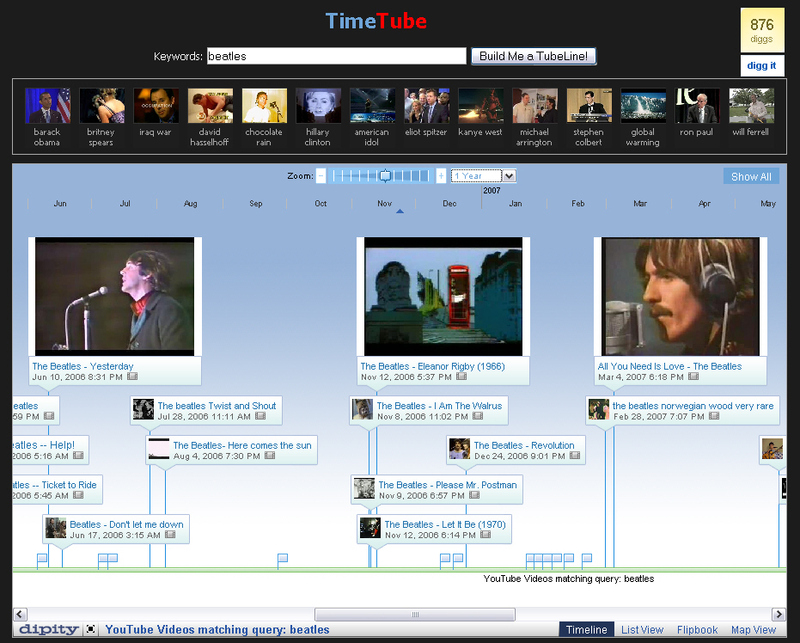 So the other day I noticed this – Time Tube – a mashup that puts the Dipity timeline interface together with YouTube. Same cool interface, but you just have to keyword search a topic and your timeline will be populated with YouTube videos a few minutes later. It’s created a fair amount of buzz over the last couple of days, most of it positive because it’s fun to use and some of the timelines are pretty interesting. But – the timelines are based on the date the video was uploaded. If all you want is a nice browsing interface this is okay – as another way to display the results of a YouTube keyword search. But as a way of visualizing information, if what you want is to add some kind of meaning or context to the videos, it’s only useful for a very narrow set of topics. It doesn’t look too bad, but there’s no real meaning there. Not even a spike when Across the Universe was released. 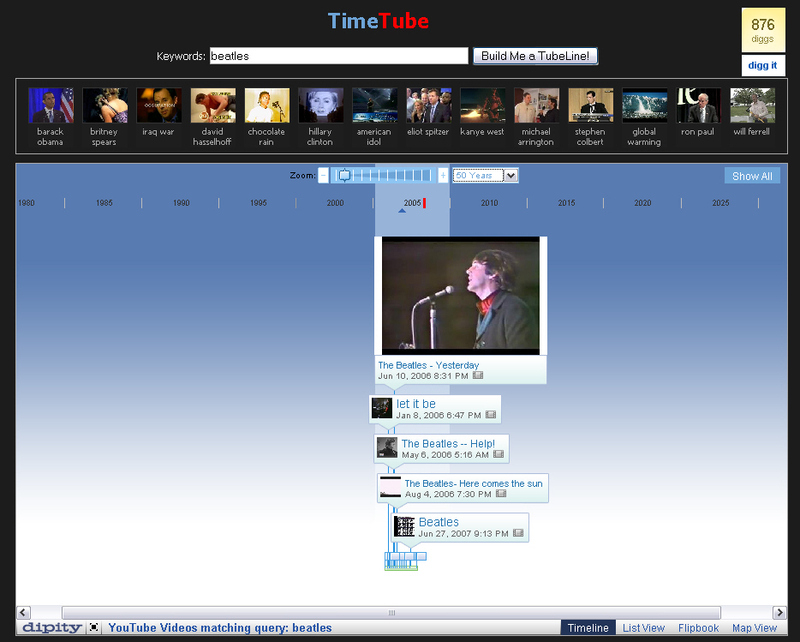 TimeTube lets you pick a longer timespan – here’s fifty years. This really shows the limitations. Everything clustered in the middle because YouTube didn’t exist until a short time ago. The fact that they let you open out your range to 20, 50, 100 years suggests that the upload date might not always be the way these things are generated? Or maybe it’s just a holdover from the original Dipity interface. The timelines created are dynamic and there’s no way to save them. There’s no account to create so you can’t find timeline buddies either. Where this is useful now is for topics, like “olympic torch protests” where people upload their videos right away after an event happens. Or to track the zeitgeist when something emerges out of nowhere to become the next big thing. Or as a fun browsable interface for a YouTube keyword search. So back in this post, I explained why one reason that I don’t like EBSCO’s new visual search is that they didn’t preserve the fun factor of the old interface. And I stand by that. So I was intrigued when I saw this in my feeds yesterday. 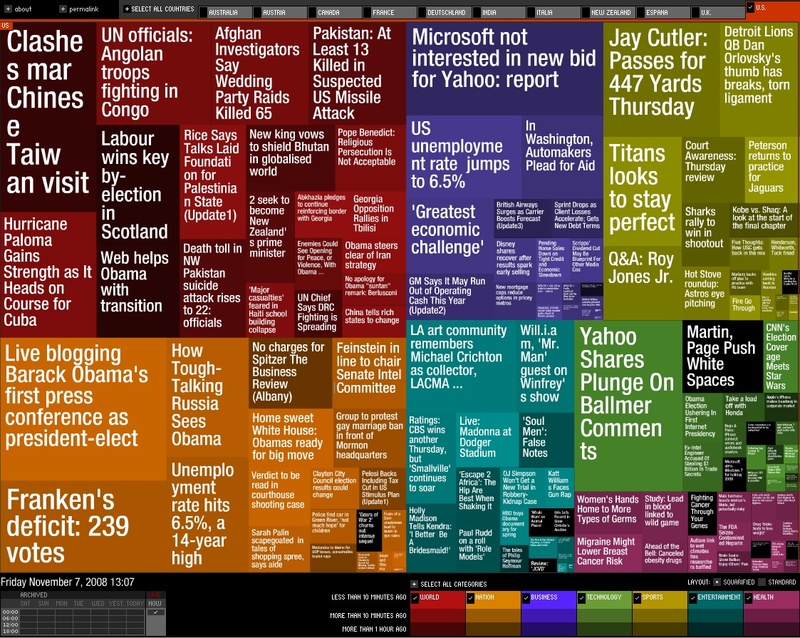 Spectra merges the news spectrum and the color spectrum into an expansive news viewing experience. With comprehensive live news coverage, striking design, complete customization, dynamic browsing, human body interaction and many other unique features, Spectra brings A Fuller Spectrum of News to life in our most immersive extension yet. You can save articles you like to a newsreader as you pick them out of the swirl. You can also search your swirl, and then all of the articles that don’t have your search term will drop out, which looks kind of cool, and which is kind of useful. And you can re-order the items in your swirl so that they’re grouped by subject, or displayed in date-time order. What’s not as useful – you can’t click on an item as it swirls by and skip to that item. I don’t know, this seems like a deal-breaker for me. I kept wanting to do it even after I knew that I couldn’t and intuitively, I think I can’t be the only person who might want to do that. And finally not as useful is the fact that the only news is msnbc news. While not surprising, this is disappointing and probably makes this a tool I won’t come back to again. The Newsware package includes games (some integrate with Facebook) that I didn’t play. It also includes widgets, screensavers, feeds and more. All in all, I think there is a lot of good work going on here – but I don’t really think they’re there yet. Back to Spectra, the headline reader, and fun. It’s a little fun to watch, and when I demonstrated it the students were interested. But I don’t think it’s interactive enough or that it gives the user enough control to really be fun to use. And fun to use is what’s really important, at least to me. I’m excited about the potential of dynamic information visualization because I think it fits into the whole idea of research as part of a learning process, based on exploration and discovery. Just watching doesn’t get you to that point. After the demonstration, when students had the option to use any of the tools I’d demonstrated, I did notice that none of them picked Spectra. I may not have been as clear on what kind of tool it was or how they might use it as I could have been. But I also think that it might be a situation of what’s fun to watch in a demonstration isn’t fun in the hands-on if all it really lets you do is watch.